One of the first considerations for the new company was what name should be given to the product. A contest was sponsored among the employees and a $50 prize was offered for the best suggestion of a brand name. As rice was the first product to be packaged there was a natural affinity to reference China and one of our salesmen suggested “China Doll” using a doll image. It was felt that a figure could be associated with the name and would make for good advertising so the brand name was adopted and the salesman duly paid his prize. At that time, $50 was quite a substantial amount of money in 1936. From Rice to Beans: After packaged rice was successfully marketed, over 20 different varieties of dried beans were added to the company portfolio to compliment the existing six varieties of rice. 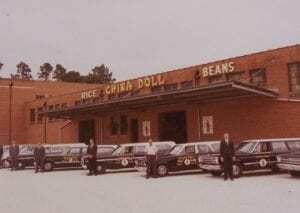 Geographical Expansion: With improvements in packaging, storage and transportation came the opportunity to increase the scope of operations and China Doll Products were soon available throughout the Southeast United States. Expansion through Acquisition: In 2008, China Doll Rice and Beans Inc. purchased the Dixie Lily brand and added some of the South’s favorite products to its already impressive portfolio. We are proud that all of our products are grown, sown and milled right here in the United States and have been since our founding! Below is a map that shows where many of our products are grown. Behind every successful business there are successful people and China Doll is no exception. Barbara Colle – The former owner and president of China Doll was with the company from when it formed until her death in 1990. Harris V. Morrissette– President, formerly owned part of Marshall Biscuits, who bought China Doll in 2005. The biscuit part of the business was sold in 2007 and the Marshall Biscuit name was changed to China Doll Rice and Beans, Inc.
Gerald E. Baggett – Vice President, Sales, started with China Doll in 1972 as a salesman and has worked for the company ever since.